I talked to my boy Marty this long weekend. He runs part of the facilities department over at Xerox El Segundo. His was a tale of woe. I owe a lot of my professional development to the management style of Xerox - continuous quality improvement and all. So it was hard for me to hear what he had to say. I started my first internship for the Big X back in 1983, my first summer in college. Since I had some real-world work experience, I was fortunate enough to land a spot with the MBA candidates and worked in the Centralized Printing Systems Division several levels beneath the legendary Hoshi Printer. Yes, Printer was his last name. Last time I checked, he was making moola at Cars.com. So I had seven years of Xerox on my resume by 1990 when I went full-time into the software business. About that time, Xerox had proven two things. Number one, it was master of the copier and printer business. Number two, it didn't know squat about the computer, software and networks business. Xerox stock limped along in the low 20s for my entire career there and its employee count was about 100,000. Here in El Segundo, where we used to actually sweat about being a target of Russian nukes, there was a vigorous set of employees of Xerox. The legendary A&E building housed first rate engineers and brown shuttle vans took folks around the campus of about 18 buildings. I myself had worked in CP-8, CP-10, XC-1 and XC-2. I sometimes had lunch in one of the 'M' buildings, the big M1 cafeteria. As an intern, I toured through M2 where some of America's first 'surface mount' technology was being deployed for Xerox printer circuit boards. Marty says that there are about 60k people who work for Xerox now. A&E is down to about 600 employees and only two of the eight M buildings still even belong to Xerox. Over in Xerox Centre, office space had been empty so long that Xerox was renting to all comers for as little as 1.50 per square foot. The boom days of El Segundo are long gone. Today, Lexmark printers are no joke. HP dominates the 'decentralized' print world. Warnock made Adobe and all the rest is history. But it remains stunning to me that these very buildings, the whole of the Xerox campus has been so drastically reduced. Where have they gone? How long are those who are left going to stay? It's all design work, so I've been told. It's what we do best in the US, come up with new ideas and figure out ways to sell them. But I miss the days of end to end, where you could be on campus and know you were 10,000 stong. Where the spirit of a company pulling together, from design to test to manufacturing to sales and marketing distribution and support were all in walking distance. The virtual corporation is real. We in IT and our crafty MBAs made it possible. Now El Segundo is less than it used to be. I wonder what's going on at Northrop. Xerox is in the news as FujiXerox takes over. But that was the pace of things in the mid 80s. Another dude I vaguely recall had the radical attitude I might have enjoined were I not so desperate to drive a BMW. He advised me to get all my hacking done before the implementation of ACF2. What we were dealing with was the gap between the time you could get engineers to understand a technology, the time it took them to implement it, the time it was adopted by the business, and the time that an actual payoff could be seen. Then there was the time it took for the capacity of the business to exceed the design limits of the system in place and the time it took for that problem to arise to the level of necessity and a new replacement process begun. I was reading Schneier this morning and one of the commenters on a thread about a breach at Monster mentioned RACF. It brought back memories. One notable one for me in particular. The reason I never became an expert on mainframes was because of the follow-up program to RACF which was ACF2. Back when I was interning at Xerox in the early 80s, the second internship I got was working for a man by the name of Jack Starkey. Starkey was an old school consummate engineer. Buzz cut, white shirts, clubman glasses, slide rule, thin tie, crisp diction. Tough but fair, one of a dying breed. My assignment from Jack seems trivial by today's standards, but took some doing back in 1984. It was to establish a data dictionary for the Xerox PSD Support database. It ran in a tool called Datamanager on an IBM 360. For this job I had to learn JCL. JCL is job control language and I soon discovered that there were a couple women in the department who worked there full-time making as much money as both of my parents put together just starting jobs and watching jobs written in JCL. It turned out that they weren't interested in helping any snot nosed college kid get the ins and outs of this language. Jack Starkey, quoth he 'RTFM', and so I hacked my way through half the summer. For every Jack Starkey, there is a Jimbo Jones. I don't remember the name of my Jimbo Jones, but he was a long-haired Wozniak look-alike who was disrespectful and anti-establishment and smarter than anybody else in the building. It turned out that he used to be an almighty SysOp but either got demoted or bored. So it didn't take me long to find out from Jimbo that if I wanted to get certain tapes mounted and have my own tracksallocated on the DASD that there were shortcuts and tricks. You see my job was not only to figure out what the structure of the whole support database was, but to help in the migration process. That meant I had to move data from one data center to another. It still gives me headaches thinking about Bulk Data Transfer and how few people knew how to make it work, and how little help those who knew a little were. At the time, some slicked back sales types descended down to Xerox to tell us about Focus 4. Focus was a new kind of database, a relational database. So we sat in the auditorium shooting paper clips at each other, Jimbo and I, while the sales creeps began to talk down to us, as if there was something magical about their new technology that none of us could understand. It was rather cool what they were showing, but they had this kind of arrogance that came from owning a technology that even IBM had yet to rollout into a product. After I displayed enough haughty nonchalance and reviewed the entire thing with Jimbo after the presentation, he confided in me. He had hacked RACF. Hacking RACF was an accomplishment of extraordinary significance. That is because back in the 70s and early 80s, the most powerful computers were IBM mainframes (notwithstanding claims of Fujitsu and Amdahl) but every flop of their circuits was eyeballed and audited by SysOps. There was no time-sharing, there were jobs and job classes. And every job and its status was monitored at all times. The job of the SysOp was to put some business priority around the most important piece of software in the world, which was the heart of the IBM 360 operating system whose function was to allocate precious CPU cycles and even more precious Direct Access Storage Device (DASD), a glorified hard drive of maybe 500MB. I never quite learned how to convert the figures back in the day, but I remember how difficult it was for me to get one cylinder of storage, which is less than one MB. Basically a floppy's worth of data. One of the other pieces of madness you had to deal with was the job classes, as I mentioned. So I'm trying to get the Bulk Data Transfer to move database parts from one datacenter on one coast to another on another coast. Nobody will give me more than 1 MB of storage, tell me the proper syntax for bulk data transfer or give me a job class with enough priority so that I can try more than once or twice a day. So I'm the intern who submits faulty JCL every day and waits for my job to abort. Big fun. I can't stand it. I meet Jimbo the week before the company cuts over to ACF2, the new, unhackable security program, and he only tells me that he's hacked RACF after ACF2 is installed. Wonderful. This became the one job I ever had where doing the documentation was more fun than doing the programming. For my documentation I used the Xerox Star Workstation, which, by the way, was hooked up to Fuji Xerox. I could send emails to scientists in Shibuya and even print documents on their printers, but could I get 1MB of data from Rochester, NY to El Segundo? Not on your life. So it was decided, I'm never going to give mainframe people the time of day. One of my other buddies there who was also sick and tired of working with these slow tired systems left and worked for a company called Britton-Lee. He did pretty well for himself. I was so sick of IBM that I decided that no matter what, I was going to work with the workstations, client/server and object oriented programming. Unfortunately, it took another decade for business data to find its way over to peer networks. Thank God LU 6.2 was a colossal failure, because I'll be damned if I was going to take it from AS/400 folks. But I did have one more stop on the IBM train that moderated my hatred for them and big iron. It was called VM/CMS, and I actually loved it, but that's another story. For what it's worth, I could have been a famous zillionaire by now. That is because I was the network admin for what once was one of the largest LANs in the world, back in 1986. It was the Xerox ESXC16 domain and it consisted of over 150 D-Machines. I cannot remember the exact details, but it was one of the top domains in Xerox outside of PARC, OSBU-South, OSBU-North and Rochester128. We had over 900MB of file service, both a PUP Gateway and a full set of XNS servers and services including about 11 print servers, a Clearinghouse and a couple of mail servers. We had one of the first fiber optic ethernet hubs on the planet. It was the bomb. Over the weekend, I happened on to some interesting documents on and off the web. It has gotten me really jazzed about some Xerox nostalgia. Just this morning, I hit the mother lode. It turns out that some cat named Don Woodward has created a virtual D-Machine for Win32. 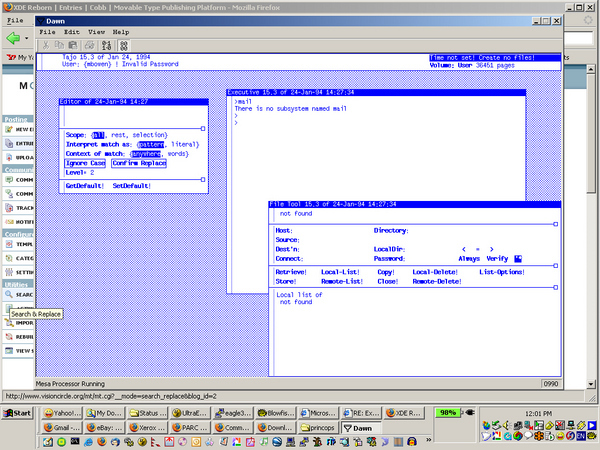 On my very desktop, right now, is a copy of Dawn and a Tajo 15.3 environment. Is this mind-blowing or what? Every year I go through a period of depression thinking about what might have been had Xerox been successful in marketing and selling the networks, operating systems, workstations and printers that they developed. And then thinking about it today, I wonder how little it might have meant considering the death of computing kings like NCR, DEC and Silicon Graphics, not to mention Apollo, Cray, and Symbolics. Still, a small but a mighty big word is 'if'. Then I wake up and realize that there were people there at Xerox who said that there was no future in email - that business people would never trust it and managers would never learn to type. The Xerox Documentor was a package which consisted of a Xerox 6085 loaded with Viewpoint software crippled so that its ethernet connectivity was disabled. I had a standalone laser printer, the Xerox 4045 attached via a proprietary (not RS232 or Centronics) interface cable. It was sold as a complete desktop publishing system and was to sell for about $10,000. The inventor of the concept of the Documentor was Charlie Levy and it was in this configuration that Xerox sold more 6085s than in any other way. The 6085 as a networked workstation was a market failure - Xerox 'sold' more of them to Xerox than to any other company. For this configuration Charlie Levy won the President's Award, the highest that Xerox offered employees. And it's making me think about a whole bunch of things I know and remember about Xerox. I'll document some of that here.